In the first of two pieces, the BBC's reporter in Ghana, Kwaku Sakyi-Addo, looks at how Ghana achieved its independence from Britain 50 years ago through the leadership of one hugely influential man. In 1957, the Gold Coast became Ghana - and the first black African nation to break from colonialism. Its leader, Kwame Nkrumah, had set a course not just for the country but for the whole continent of Africa. "When we talk about Africa for Africans we just proclaim our right to rule ourselves," he said. 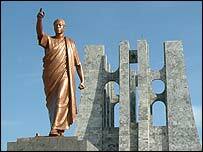 Ambitious, intelligent, well-read and fired up by exile and the struggle for liberation, Nkrumah wanted big things for both Ghana and Africa. He believed he was blazing the trail for pan-African unity. 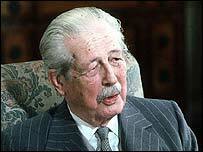 And in a famous speech, the British Prime Minister at the time, Harold Macmillan, indicated his support for the idea. "The wind of change is blowing through the continent... the growth of national consciousness is a political fact and we must take account of it," he said in 1960. Just three years later, 17 more colonies had gained their independence. "My father was a great leader - he instinctively knew that even the largest [populated] African country, Nigeria, or the wealthiest, South Africa, could not survive as a political entity," recalls Nkrumah's son, Gamal. "He was thinking ahead in terms of African unity." Why Ghana, in particular, led the surge of independence was partly to do with Nkrumah's tireless campaigning, but was also because the time and place were right. The Gold Coast had been a model colony - operated indirectly by the British with the support of traditional chiefs, it was relatively peaceful, and certainly more stable than neighbours like Nigeria and Sierra Leone. Meanwhile, the colonial powers were struggling for money in post-war Europe. About 65,000 soldiers from the Gold Coast had fought alongside the British in World War II, and had returned home to poverty and unemployment - not at all what had been promised. Their plight galvanised the independence movement - and after three ex-servicemen were shot dead by colonial officers in February 1948, with 12 dying in the resulting riots, colonialism was doomed. A year later, Nkrumah was leading the Convention People's Party, demanding "self-government now". By 1952, he was prime minister - and five years after that, he was in Accra declaring: "Ghana, my beloved country, is free forever." And he had ambitious plans for his small, freshly-liberated country of four million people. His aim was to develop Ghana as an industrialised, unitary socialist state - and to do it fast. 1948 - Begins travelling Gold Coast as leader of youth movement, proclaiming "self-government now"
"He had big dreams for Ghana; it should become the gateway of Africa," says KB Asante, who worked alongside Nkrumah for a number of years. "Poverty was to be eradicated through industrialisation to improve agriculture. There were to be seats of higher learning, and no barriers to education. He believed in all these things." But things were rapidly changing in more sinister ways too. Only one year after independence, Nkrumah had got parliament to agree to the Preventative Detention Act. He could now detain anyone who opposed his ideas for up to five years without trial. 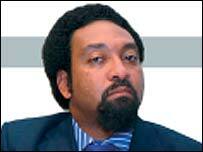 "Many people still have a wrong view of him," says RR Amponsah, one of his main political opponents at the time. "He was an autocrat and dictator. People still think Ghana would be a place of roses if he had stayed in power. That's not true at all." Amponsah was falsely charged with organising a coup against the government, and imprisoned without trial for over six years. "A British police officer came to me and said, 'you are under arrest'," he recalls. "He pulled a gun and said, 'come at once or I will blow your head off.' There were military men and senior police officers; they told me to sit and wait. Then they charged me with organising a coup. "I was shocked. How? There was no truth in that." By 1964, Ghana was a one-party state, and Nkrumah life president. Two assassination attempts had increased his paranoia, and a tottering economy, human rights abuses, and unpopularity at home and abroad meant that the 1966 coup against him was not a surprise to anyone. It was carried out by two dissident soldiers - colonel Emmanuel Kotoka and Akwasi Afrifa - and supported by the police and army. There are also suspected links with the American CIA, who were finding Nkrumah and his socialist ideas a liability on the other side of the Cold War. "There is no evidence of actual support, but they made it known it wouldn't be a bad idea if Nkrumah went," says KB Asante. "There were shortages and people were generally happy that he was no longer in charge of affairs." The coup took place on 24 February 1966, only two days before Gamal Nkrumah had said goodbye to his father, departing for a trip to Russia and the Far East, at Accra airport. Gamal never saw his father again - and nor did Ghana. Kwame Nkrumah went into exile in Guinea; it was close to Ghana and was close to its President Sekou Toure. His time at the helm of Ghana and Africa was over so quickly. A unique and well-intentioned man, thwarted by intolerance and impatience, with a little shove from military opportunists and, perhaps, from Washington. He died from cancer in 1972. But his ideas and achievements are there in the very fabric and foundation of our country - and of Africa - for ever. Part One of Ghana, Winds Of Change was broadcast on BBC World Service on Monday 26 February. Thousands of revellers take to the streets of Accra as the country turns out to celebrate. Who do Ghanaians think you are?